At Chong Immigration Law PLLC, we believe the fabric of the nation is made stronger through immigration. Providing dedicated representation, our law office serves clients throughout Maryland, Virginia and Washington, D.C. Starting with an initial consultation, we discuss the details of people’s cases and offer advice on the next steps they should take. Coming from a long line of immigrants himself, our founding attorney has a profound respect for those who seek their own piece of the American dream, as well as a unique understanding of their plight. We have aided clients from a range of backgrounds, including scientists, doctors, athletes, and business executives, to bring their skills, talents, and passions to the U.S. Throughout each phase of the process, our law office stands by those we represent. By helping them understand what to expect and what obligations they are required to meet, we help people navigate the complexities of becoming U.S. citizens, in addition to obtaining nonimmigrant visas, employment-based Green Cards and family-based immigration visas. Our attorney assists engaged and married couples, parents, and siblings to establish their lives together in the U.S. We are also very experienced in helping LGBTQ couples to obtain marriage-based green cards. When, due to past persecution or fear of such threats, people cannot return to their home countries, we at Chong Immigration Law PLLC aid them in pursuing asylum relief. We know what is at stake for our clients, and we show them what their rights are. Our attorney helps people file the appropriate petitions and documentation to avoid the threats facing them in their home countries and to make their new homes in the United States. Our law office accepts credit cards for the convenience of those we represent. This law firm is great responds immediately after receiving your question or concern and are specific and clear with answers. Thanks to the help of them our case was solved and everything turned out well. 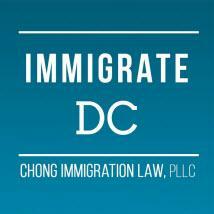 I would highly recommend Chong's Law Firm to anyone who is seeking professional help on immigration issues. Based on my experience, I believe Cameron and his team are well capable of handling various types of immigration cases. My case was challenging and complicated. Cameron took on this case and analyzed the situation thoroughly and responded to me in a very timely manner. He explored all possible ways to get my case approved. With his help, my case was nicely solved within the shortest time. In addition, the service fee is very reasonable. If you want to save time and money and meanwhile get the most professional service, Chong's Law Firm is definitely your #1 choice!